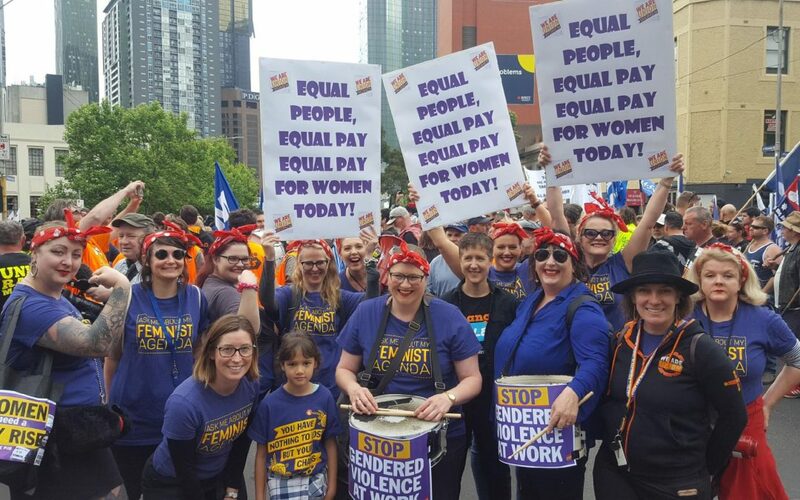 The Anna Stewart Memorial Project is a collaboration between unions and the Victoria Trades Hall Council’s (VTHC) We are Union Women team to assist union women develop leadership skills. Luke Hilakari, Secretary of VTHC welcomed us, and spent the next 2 weeks with the We are Union Women team members, each fantastic driven, intelligent women. Big thank you to Harriet, Audrey, Jodi, Pia and Stephanie (pray I have left no one out). Proudly I was one of the latest “Anna’s”, a privileged title when you hear of our previous Anna’s such as ASU’s Secretary Lisa Darmanin, the list is extensive and to meet past Anna’s a new comradery develops. I realised the company I was in within our group too – amazing women with passion, conviction, wisdom and courage to achieve against odds as Delegates in their union. We were so fortunate to be part of the October 2018 intake, a busy and intense fortnight. We were the first group to attend camp for a few days, where workshops took place and the process of getting to know each other form, storm and norm could happen quickly. Camp Eureka was rustic but the environment relaxing and our hosts/facilitators were fantastic they thought of everything, movie night included with the popcorn! Workers Memorial under the Westgate Bridge, 15 October. Sally McManus addressed our group prior to the proceedings, and we stood with widows, sons, daughters, families and comrades still dealing with the consequences of unsafe work practices to this day. Safety at work, OH&S is not negotiable and it won’t be the last time I attend the memorial. Will Stracke led and taught us the art to a campaign. APHEDA Union Aid Abroad inspiring us on International Solidarity, for as little as $15 a month you can join, assisting 60 projects in 15 countries, if a Cambodian worker can pay her union fees……. Gender Violence at Work Campaign and Family Violence as a Workplace issue – I was proud to be ASU with the work done on Family Violence Leave Clause and 10 days paid family violence leave as part of the National Employment Standards, we should be proud other unions and VTHC are taking on what ASU has created. We were challenged and empowered by Ed at VTHC who did an awesome workshop with us, with great energy, those who didn’t think they had a voice found it. Panel of Sisters in Union – all women to aspire and learn from it was great to see Lisa among those sisters on the panel. Telephone phone banking at the Australian Nursing and Midwifery Federation (ANMF) union building, another skillset we were taught and put to practice, speaking proactively to women’s issues and to put the Liberals last. Days spent at our own union assisted us to develop greater understanding of the unions we are delegates and I would like to thank to all the ASU staff for making me feel so welcome. Thanks to the organisers taking me out to Depots and getting to meet other fellow delegates in the workplaces, it was such a learning experience. Spending time in the Contact Centre was rewarding as they attend to members with respect and compassion. Another reason the timing of Anna Stewart Memorial Project was so great was we were entering the election and with that I was super fortunate to attend an outing to the Kyneton’s Men’s Shed with Lisa Darmanin and Leon Wiegard to hear the Premier Daniel Andrews announce a Royal Commission into Mental Health if re-elected. It was a unique experience to see the election campaign and media in action. Feminism in the Pub, getting the opportunity to be on the panel discussing equal pay was a great experience and again the women I sat next to were awe inspiring. United Voices, Big Steps Campaign and the Cleaners and the Nurses, were passionately represented. Although it is awful that we are still talking about gaining equal pay for women in 2018, I thought it was bad in 2010! But the ASU knows this can be won. Another event I look forward to attending in the future, I hope to see you there? The day of the rally 23 October 2018, included breakfast radio interview on 3CR with George. It was an honour to spread the word about the Anna Stewart Memorial Project and what Anna fought for in her time as a unionist, the rally and why we need to Change the Rules. To write this and reflect on all we did and what we achieved in the two weeks is a whirlwind but it was a great ride. I’ve learnt and met strong, intelligent women whom I’m proud to call sisters, Anna’s and Comrades.